Love surprises? 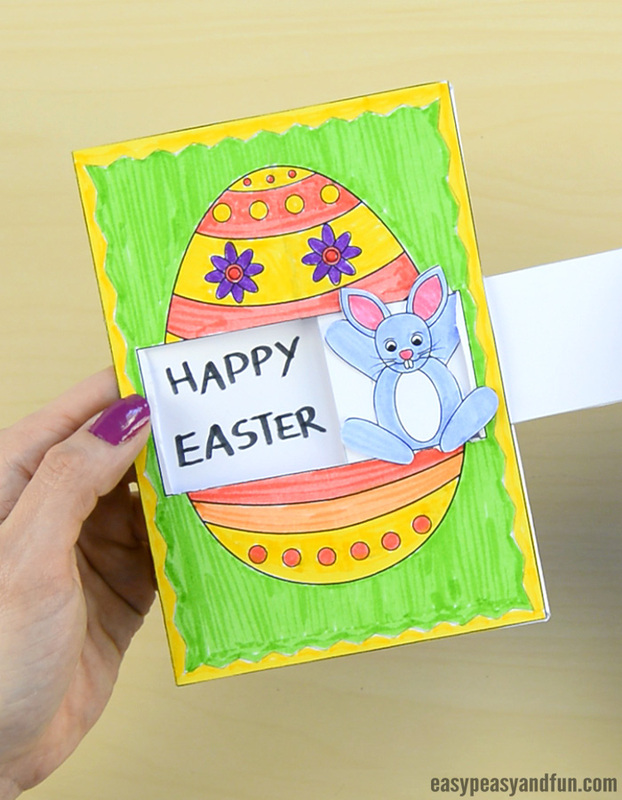 Get creative during the Easter holidays and amaze your close ones by making an adorable hidden message Easter card. We got two unique versions of this mysterious card for your kids or students to make and enjoy putting together. Easter is bringing us a bunch of cute little animals such as Easter bunnies, chicks, lambs and thematic symbols like Easter eggs and others. 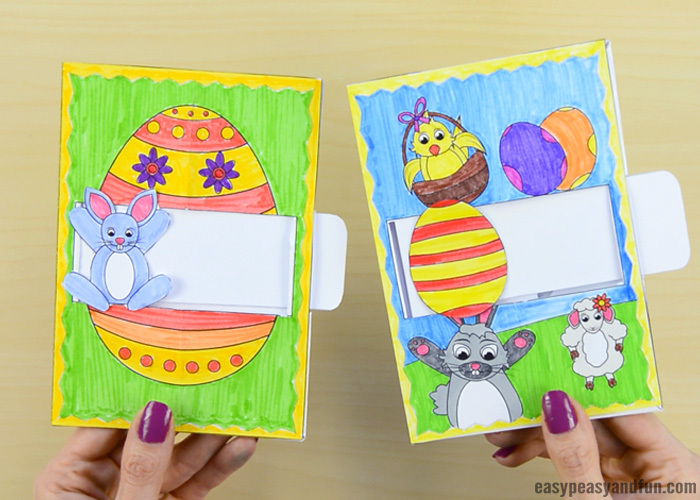 As we love to color and get our hands-on on everything that’s cute, easy and fun to make, we’ve prepared a cool pack of two Easter cards to share with you and your kids during these holidays. 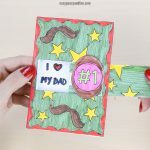 Surprise your close ones by making a unique colorful Easter card with a hidden message inside. These cards will surely make a great present and a wonderful decoration for the upcoming Easter. 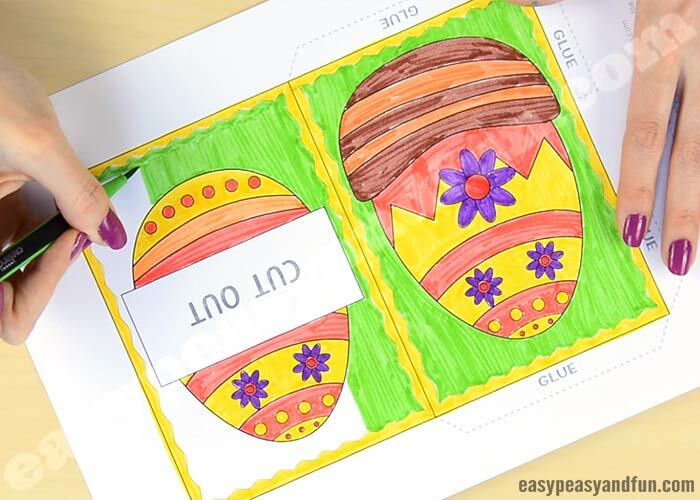 You can choose between two versions of the hidden message Easter card, or simply print, color and make both of them. 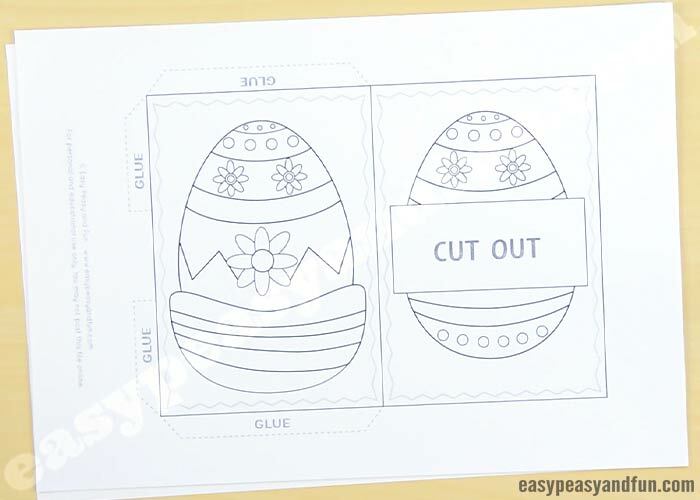 The first Easter card template has a big Easter egg on the front and back side. 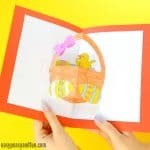 On the second hidden message template, there is an Easter bunny, a chick in a basket, and some more Easter eggs to color. 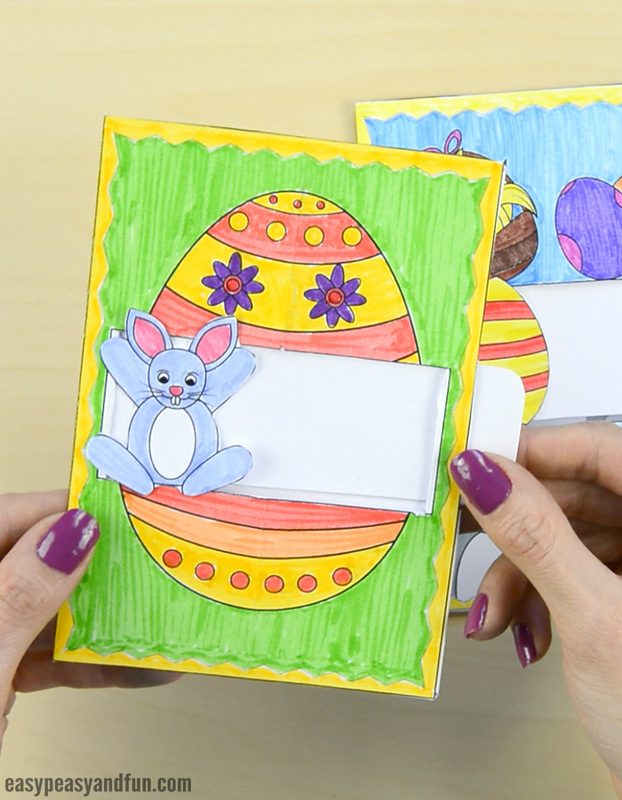 Both of the cards include 3 images for the sliding mechanism – a bunny, an Easter egg, and a flower – to choose from. 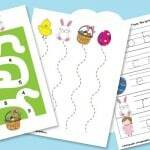 Ready to make the Easter cards? Let’s get busy! 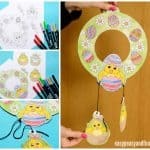 Ready to make your Easter card? Let’s start! 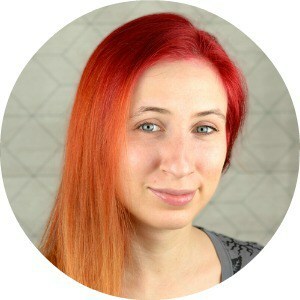 Choose your preferred version and print it out (find it at the end of this tutorial). 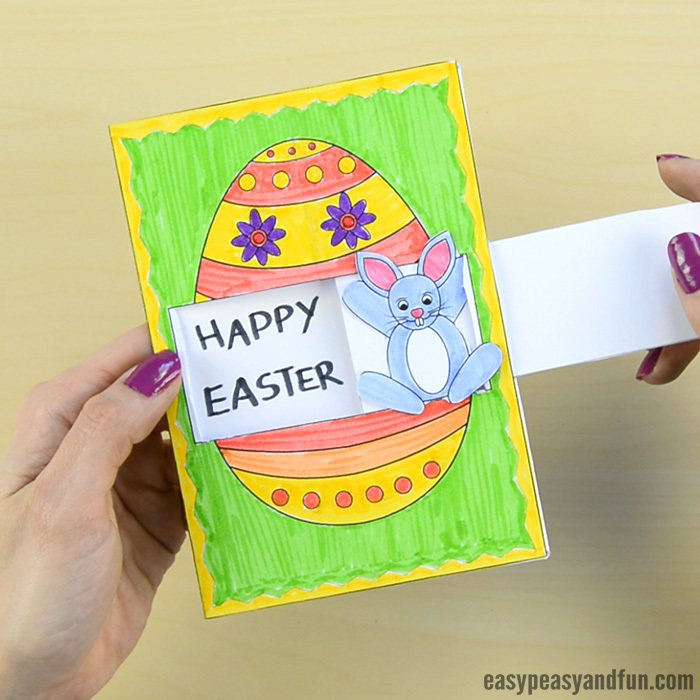 Color the card template with some vivid colors to make it really pop out. We used a green marker for the background and a yellow one for the frame. 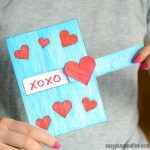 Use your scissors to cut out the template along the dashed lines. Choose your favorite image for the “window” mechanism and color it. 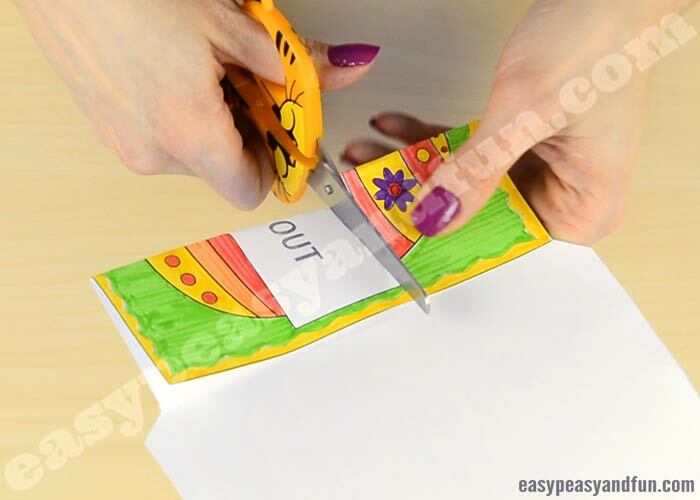 Fold the front side of the hidden message card in half (the one that has a caption “CUT OUT”), to make it easier to cut out the card’s window. Fold all flaps of the card and create crisp folds by pressing them down nicely. It’s time to insert our pull-out mechanism (we’ve cut it out from the second page of the template). Apply some glue to the flaps of the card, and make sure you got your sliding mechanism in place before you fold the card together. 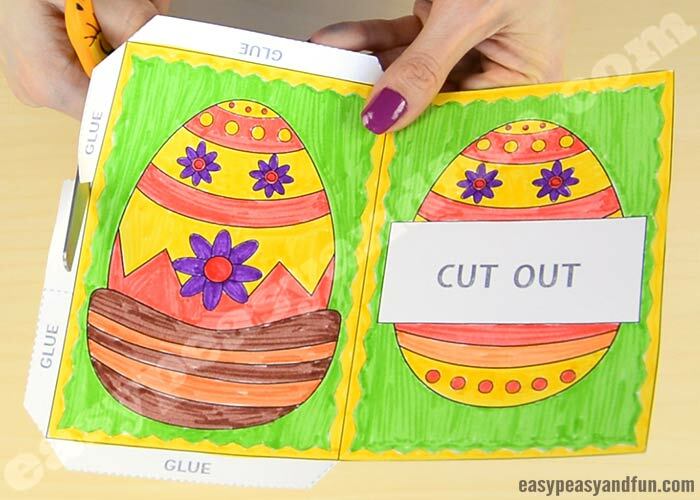 Fold your Easter card up so it glues together. Apply some glue to the sliding mechanism, and place on your chosen image (we’ve decided to go with an Easter egg). …and slide the mechanism back into the card, to hide it. Your hidden message Easter card is all done and ready to bring joy. Get template here version one and version two.